Brutalism (or New Brutalism) was a popular architectural style from the 1950s through the mid-1970s that evolved from the work of Le Corbusier and Mies van der Rohe. It is uncompromising in its approach, believing that practicality and user-friendliness should be the first and foremost aims of architectural design. Materials such as steel and concrete are favored. Although the word Brutalism comes from the French word for rough concrete ( beton brut), a sense of brutality is also suggested by this style. Buildings designed in this style are usually formed with striking blockish, geometric, and repetitive shapes. The structure is typically heavy and unrefined with coarsely molded surfaces -- usually exposed concrete. The smooth texture of glass for windows and doors forms an attractive contrast. Most windows do not open, and the building is thoroughly climate-controlled. The design of the building is largely dependant on the shape and placement of the various room masses. Outlines are quite intricate and exterior walkways are emphasized. Relatively easy to construct and easy to maintain, these new buildings lacked the 'skeletal' appearance of early International style buildings. Being forged largely out of raw concrete, they were often seen as a quick and easy way to construct "lasting" buildings in the 1960s and 1970s. Brutalism was a response to the glass curtain wall that was overtaking institutional and commercial architecture in the 1960s. The style originated in England, but its design quickly spread throughout the world, as it afforded an attractive and relatively inexpensive solution to weather and climate control conditions in large buildings, as well as providing a finish that was less vulnerable to vandalism. The 1960s and 1970s were years of great expansion in universities and public buildings, and this is where the Brutalism style is most often found. The line between brutalism and ordinary modernism is not always clear since concrete buildings are so common and run the entire spectrum of modern styles. Designs which embrace the roughness of concrete or the heavy simplicity of its natural forms are considered Brutalism. Other materials including brick and glass can be used in Brutalism if they contribute to a block-like effect similar to the strongly articulated concrete forms of early Brutalism. While the origin of Brutalism is generally ascribed to the architect Le Corbusier, the American architect Paul Rudolph designed some of the most famous buildings of the Brutalism style. This style's greatest promoter, however, was the firm John Portman & Associates which designed several enormous "atrium hotels" and office clusters known for their spectacular spatial effects, including the Bonaventure Hotel in downtown Los Angeles. 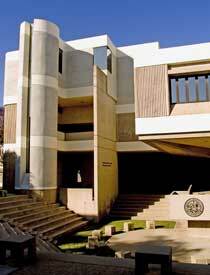 In Orange County, most of the original buildings constructed in the late 1960s on the UC Irvine campus were designed in the Brutalism style by William Periera. 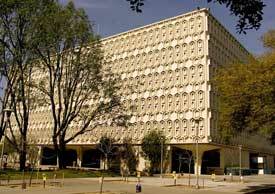 There are several examples of Brutalism architecture in Fullerton. 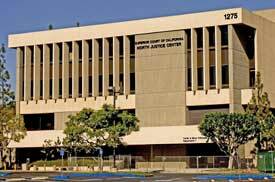 The North Orange County Municipal Court complex of buildings at 1275 N. Berkeley Avenue (1972) is a melding of New Formalism and Brutalism styles. 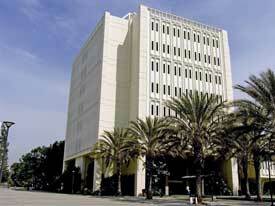 The Southern California College of Optometry (1973) at 2575 Yorba Linda Boulevard is Brutalism architecture, and a couple of buildings on the CSU Fullerton campus also have Brutalism themes: Langsdorf Hall and the Pollak Library. "Brutalism." Encyclopedia of 20 th Century Architecture, Volume I. Edited by R. Stephen Sennott. New York: Fitzroy Dearborn, 2004. Lichtenstein. Claude. As Found--The Discovery of the Ordinary: Independent Group and New Brutalism. New York: Lars Muller, 2002.